Intimate and smooth pop jazz recorded in New York with the city's hottest new breed jazz players and the woodwinds & strings of the Toronto Symphony. Produced by Glenn Marshall (Daniel Lanois). 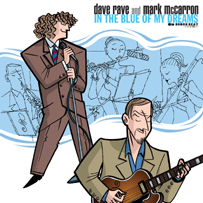 Dave Rave and Mark McCarron first galvanized their love of jazz, pop, Ravel and Debussy on their 2002 CD release Another Side Of Love (Bongo Beat). Dave and Mark push the jazz envelope; incorporating woodwinds and strings; taking their experiments into the outskirts of post-bop traditionalism with this new CD, featuring such notable underground NYC jazz players as Matt Ray (piano), Joe Bussey (bass) and Stefan Schatz (drums) and the woodwinds/string players from the Toronto Symphony - a subdued and sophisticated sound. Dave Rave (aka David DesRoches) is a musician's musician. To rockers, he is the manic Teenage Head rhythm guitarist who split to New York to head the Dave Rave Conspiracy, play with The Washington Squares before running off with Lauren Agnelli for three lps as Agnelli-Rave. Musicians know him as a valued session player (Alex Chilton, Steve Wynn, Dan Lanois, Andrew Loog Oldham, and countless others) and savvy co-writer. Jazz guitarist Mark McCarron has worked with such notables as Ed Bickert, Don Thompson, Jack McDuff, and the Mingus Five Guitar Band, in addition to studying with Bob Brookmeyer and others. Originally from St. John, New Brunswick, Mark lives in New York and is involved with such Broadway shows as SWING, and RENT. He is an in-demand arranger and session player, in addition to having taught in Hamilton and Toronto. Recorded in New York City and Hamilton, Canada; In The Blue Of My Dreams is a playful romp through the jazz rulebook, immensely accessible as it gently explores jazz pop forms, wrapping its musical sophistication in a smooth confection of flute/bassoon/cello/clarinet/oboe within a traditional quartet setting. "Dave Rave, refered to by some as 'Canada's Nick Lowe,' is not a trance/electro/techno DJ but in fact a jazz artist with an album, In the Blue of My Dreams - 'The Song is You' is a romantic, relaxing number and 'At The End of the Day' shows impressive vocal and instrumental arrangements that suggests Jamie Cullum control over pop jazz is in trouble!" Cover art is once again by Tom Bagley, Bongo Beat's unofficial arbiter of cool. Please visit Dave's sites for up to date touring information.